Another gift from the wedding reception. 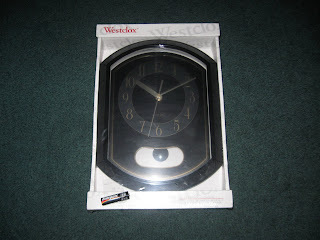 A wall clock, can't wait to hang this on the wall. But wait, I have no idea where would be a great spot. Might be in the kitchen or in the living room. These gift was given by one of Jeff's co-worker at Pizza Hut. It is a nice once, hopefully it make sounds whenever it strikes in hour. oi babay kumusta naman ka? ako im preggy. ikaw pagbuhat na aron di ka mauwahi lolz. nice clock sis. asa man nimo butang. sa living na lang. mag buot pa jud ko. lol. Ur link is ready along time with title ; pamangkinnakoni. please check it and don't forget link me too. Love doesn't make the world go round; love is what makes the ride worthwhile. Happy Tuesday!